March 31, 1925: Frances (Judy) danced and modeled children’s wear at the Itasca Dry Goods Company show in Grand Rapids, Minnesota. This event has also been noted as taking place the following day, April 1st. March 31, 1930: “The Gumm Sisters” (Judy and her two sisters) participated in Mrs. May Burk’s Music Pupil’s Recital at the Lancaster High School auditorium, in Lancaster, California. 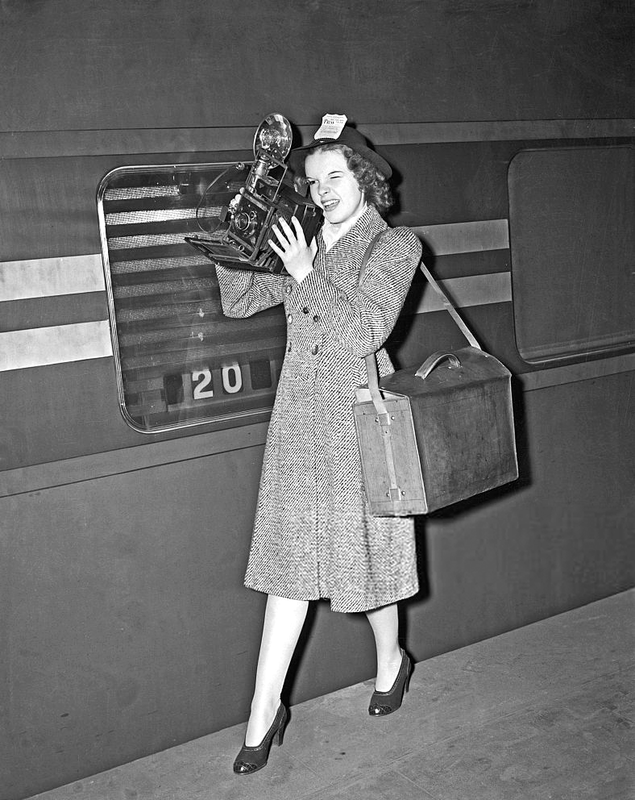 March 31, 1938: Judy, along with mom Ethel Gumm and mentor Roger Edens, arrived in Grand Rapids, Minnesota. This was the final stop on the Everybody Sing tour. Judy stayed through April 1st. They had spent the night in Minneapolis after having taken the Hiawatha train from Chicago to Minneapolis. 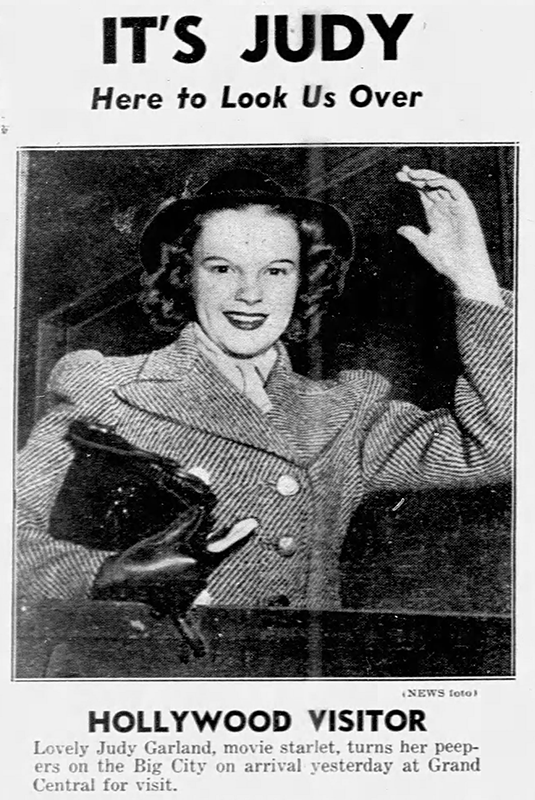 The Minneapolis Star newspaper noted that Judy had no scheduled appearances for this one-night stay in Minneapolis although she did meet her fans at her hotel. The next morning the group left by train to LaCrosse where they were met and escorted car to Grand Rapids. In Grand Rapids, they were greeted by most everyone in the town while the high school band played. This was the first and only time that Judy returned to her hometown since the family moved to California in 1926. This was also Judy’s last visit to Grand Rapids for the rest of her life. She never returned although she did return to Minnesota in 1958 for the state’s centennial. 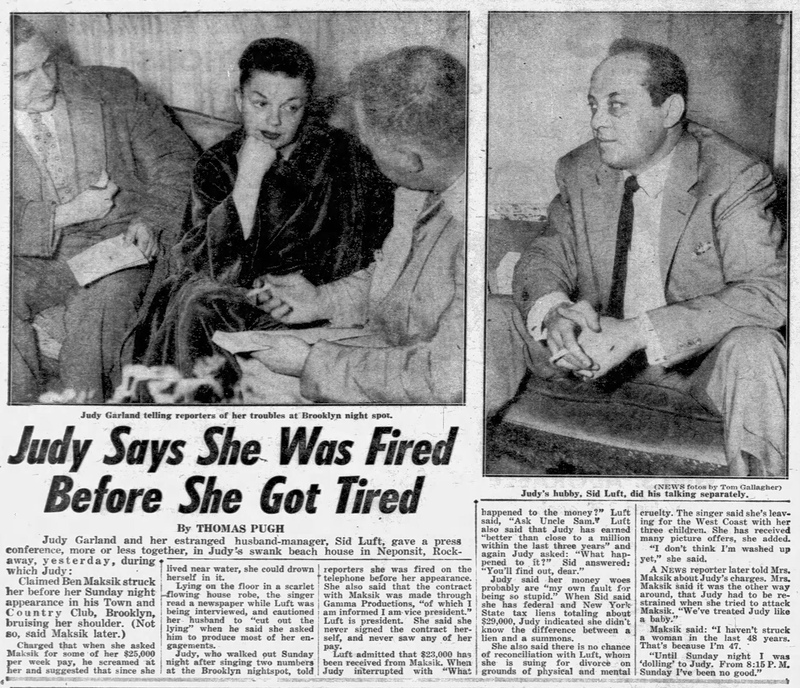 Photos: Two Minneapolis articles about Judy’s return; Ethel (Judy’s mom) does Judy’s hair; Judy on the train; Photo of Judy allegedly in Grand Rapids with a gift of flowers – possibly taken on April 1st; Two more newspaper clippings. March 31, 1938: Judy Garland frocks. March 31, 1939: Judy arrived in New York City for another personal appearance at Loew’s State Theater and at least one radio appearance. She had left Los Angeles, California, in late March, not long after completing some retakes for The Wizard of Oz which completed her work on the film. She went on a five-week personal appearance tour which included a return to Cleveland, Ohio. The newspaper clipping is from April 1st. 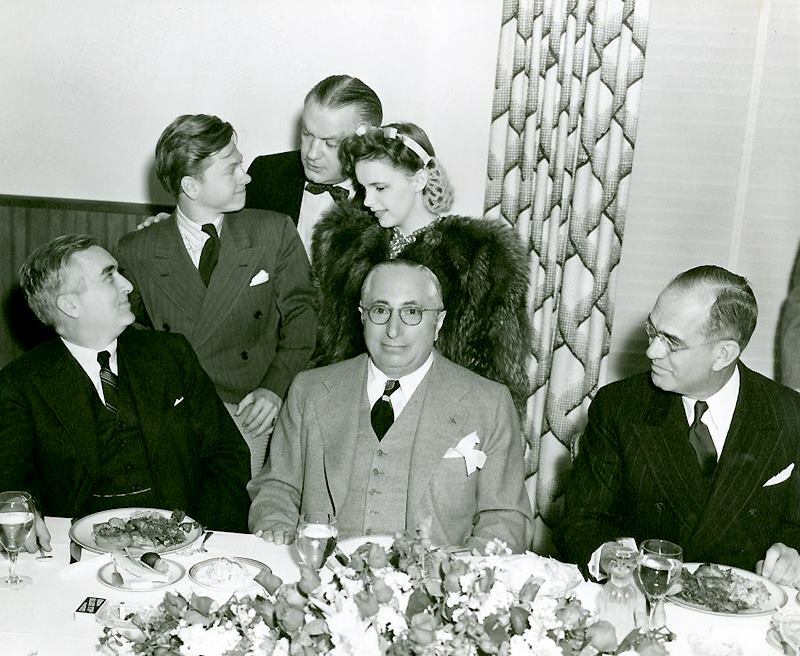 March 31, 1940: The “Los Angeles Times” reported on a luncheon that Judy and Mickey Rooney attended at MGM with studio boss Louis B. Mayer and some visiting dignitaries that Mayer was celebrating. It’s nice to finally know who these men are in this photo that’s been circulating around for a while. The visiting dignitaries pictured are: Secretary of the Navy Charles Edison, Commander-in-Chief of the U.S. Fleet Admiral J.O. Richardson, both seated on either side of Mayer. In the back is MGM producer J.W. Considine Jr. Others are listed in the article. Because this was reported on March 31st, the event likely took place a day or two prior. Judy’s schedule in late March was unusually light consisting of just her weekly appearances on Bob Hope’s radio show and early work on Andy Hardy Meets Debutante. The break wouldn’t last long. In early April Strike Up The Band went into production beginning one of the busiest periods in Judy’s MGM career. 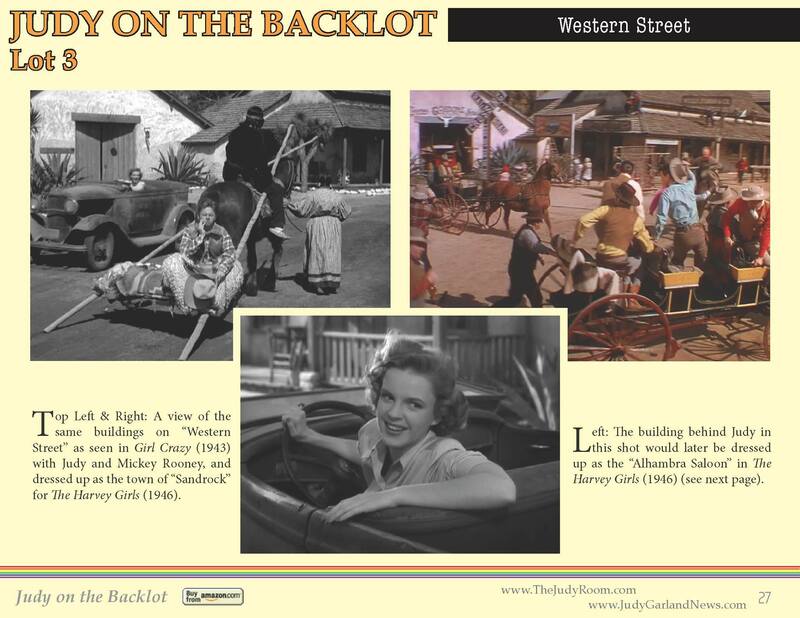 March 31, 1943: Girl Crazy filming consisted of scenes on the “Exterior Post Office” and “Exterior Campus” sets on MGM’s Backlot #3, the Western Street section. Time called: 10:35 a.m.; dismissed: 5 p.m. 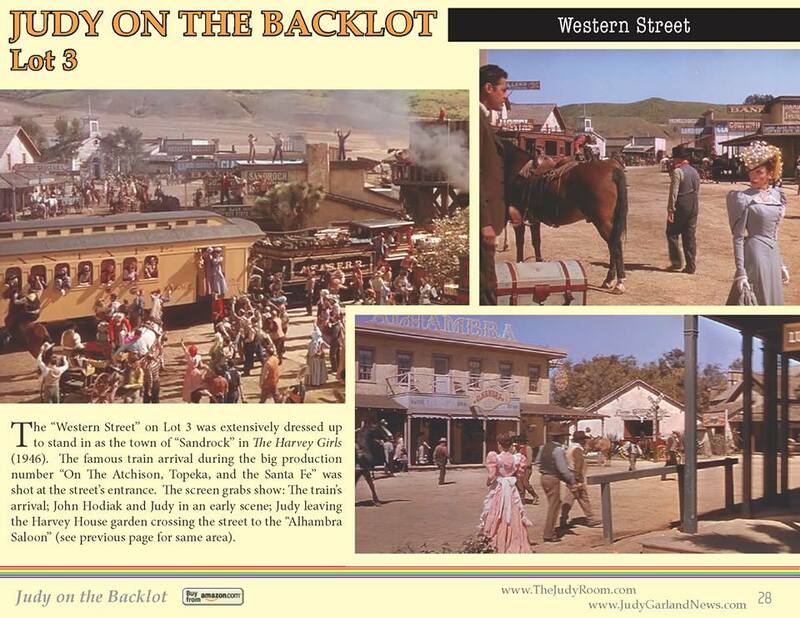 The page above is from the “Garlands for Judy” webzine’s special “Judy on the Backlot” edition. Check it out here (PDF). March 31, 1944: This photo was taken of Judy and co-star Leon Ames on the Meet Me In St. Louis “Smith Home Xmas Seq [Sequence].” No other details about the day’s filming are known. Judy was due on the set at 10 a.m. 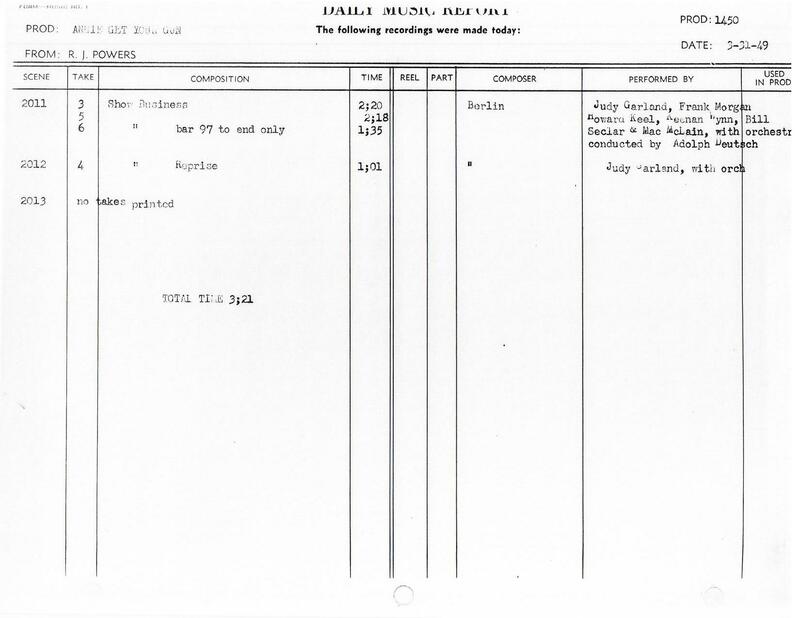 Per the assistant director’s notes: “8:57-11:40 – Witing for Garland: due at 10 a.m.; at 9:15 she phoned that her makeup woman [Dottie Ponedel] was ill, that she didn’t think that anyone else could make her up properly; Dave Friedman and cameraman went up to her room to see her and persuaded her to get made up by Bill Tuttle; she consented and arrived on Lot #3 made up at 10:45 but not ready until 11:05 – all dressed and made up, but found that she has wrong hairdo: she had to be sent to dept. to have hair done over, and was ready on set at 1:18 p.m.” Dismissed at 5:40 p.m.
March 31, 1949: The pre-recording sessions for Annie Get Your Gun continued with Judy and co-stars Howard Keel, Frank Morgan, and Keenan Wynn recording “There’s No Business Like Show Business” as well as Judy recording her solo version of the same song. Time called: 11 a.m.; due on set 1 p.m.; arrived on set 1 p.m.; dismissed: 4 p.m. Sadly, Frank Morgan, who most famously played “The Wizard” in The Wizard of Oz died during production, on September 18th, and was replaced by Louis Calhern. Check out The Judy Room’s Filmography Page on Annie Get Your Gun here. March 31, 1951: Judy on the cover of “Picturegoer” magazine. Looking lovely as usual. From the Rick Smith Collection. Thanks, Rick! March 31, 1953: Easter Parade lyrics as printed in the Danish “Uge Revyen” fan magazine. March 31, 1956: Judy recorded “Come Rain Or Come Shine” followed by “Life Is Just A Bowl Of Cherries”; “Last Night When We Were Young”; and “Any Place I Hang My Hat Is Home” for the Capitol Records “Judy” LP at the Capitol Records studios in Hollywood, California. This session completed the “Judy” album which was released on October 10, 1956. Check out The Judy Garland Online Discography’s “Judy” pages here. March 31, 1960: Judy and Sid are seen at the movies. They saw The Fugitive Kind with Marlon Brando and Anna Magnani. March 31, 1961: Judy’s upcoming concert at Carnegie Hall sold out so a second concert on May 21st was added. March 31, 1963: Margaret McManus interviewed Judy about her upcoming TV series. Judy mentioned that she didn’t “think of it as so formidable I’m going to be a female Perry Como,” which was a reference to the format of Como’s popular series. Judy also talked about the security she hoped the series would give her. March 31, 1967: It was reported that not only would Judy sing five songs in the upcoming production of Valley of the Dolls, but that one of the “big reasons” she signed on was that Andre Previn was going to write the songs for her. Talk about fiction!